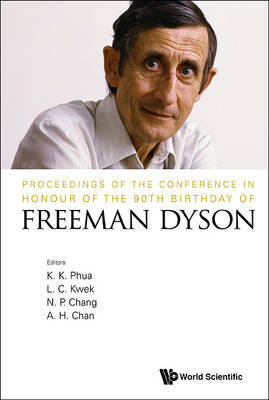 Professor Freeman Dyson, a great physicist, thinker and futurist, has been very active in scientific, literary and public policy activities throughout his career. As a tribute to him on the occasion of his 90th birthday and to celebrate his lifelong contributions in physics, mathematics, astronomy, nuclear engineering and global warming, a conference covering a wide range of topics was held in Singapore from 26 to 29 August 2013. Distinguished scientists from around the world, including Nobel Laureate Professor David Gross, joined Professor Dyson in the celebration with a festival of lectures.This memorable volume collects an interesting lecture by Professor Dyson, Is a Graviton Detectable?, contributions by speakers at the conference, as well as guest contributions by colleagues who celebrated Dyson's birthday at Rutgers University and Institute for Advanced Study in Princeton.About Freeman DysonFreeman John Dyson FRS, born December 15, 1923, is an eminent English-born American physicist, mathematician, and futurist. He is famous for his work in quantum electrodynamics, solid-state physics, mathematics, astronomy and nuclear engineering, as well as a renowned and best-selling author. He has spent most of his life as a professor of physics at the Institute for Advanced Study in Princeton, taking time off to advise the US government and write books for the public. He has won numerous notable awards including the Enrico Fermi Award, Templeton Prize, Wolf Prize, Pomeranchuk Prize, and Henri Poincare Prize.